Some after-the-fact search-fu revealed that the thread found on brooms and paint rollers is a 3/4-5 Acme. Machinery’s Handbook has 13 pages of data for various Acme screw threads, making a distinction between General Purpose Acme threads and Stub Acme Threads: GP thread depth = 0.5 × pitch, Stub = 0.3 × pitch. For a 5 TPI thread = 0.2 inch pitch, that’s GP = 0.1 inch vs. Stub = 0.06 inch. I measured a 5.0 mm pitch (which should be 5.08 mm = 0.2 inch exactly) and a crest-to-root depth of 1.4 mm = 0.055 inch, which makes them look like 3/4-5 Stub Acme threads. But, I didn’t know that at the time; a simple half-cylinder 2.5 mm wide and 1.25 mm tall was a pretty close match to what I saw on the broken plastic part. Although OpenSCAD’s MCAD library has some screw forms, they’re either machine screws with V threads or ball screws with spheres. 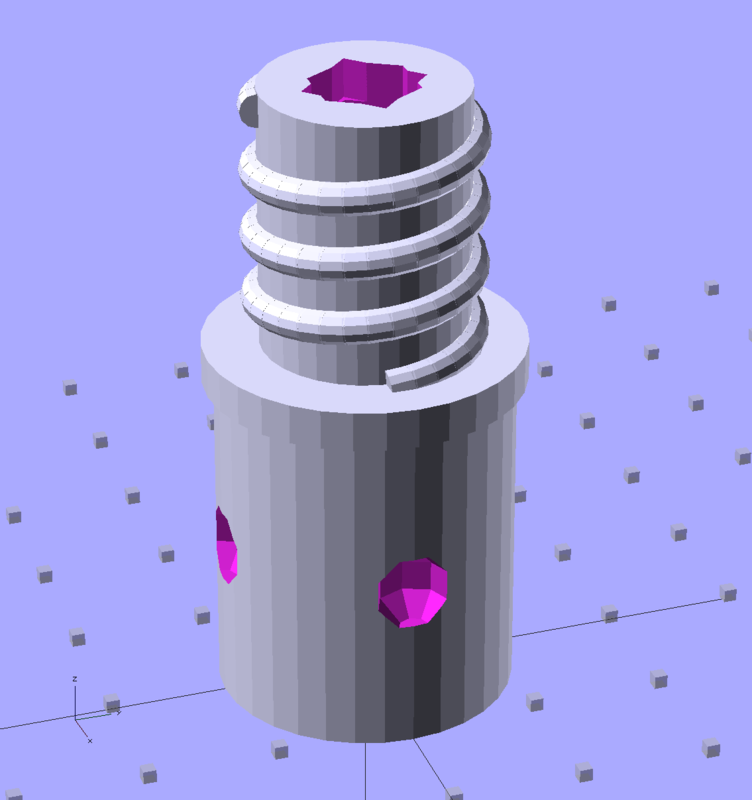 The former obviously weren’t appropriate and the latter produced far too many facets, so I conjured up a simpler shape: 32 slightly overlapping cylinders per turn, sunk halfway in the shaft at their midpoint, and tilted at the thread’s helix angle. 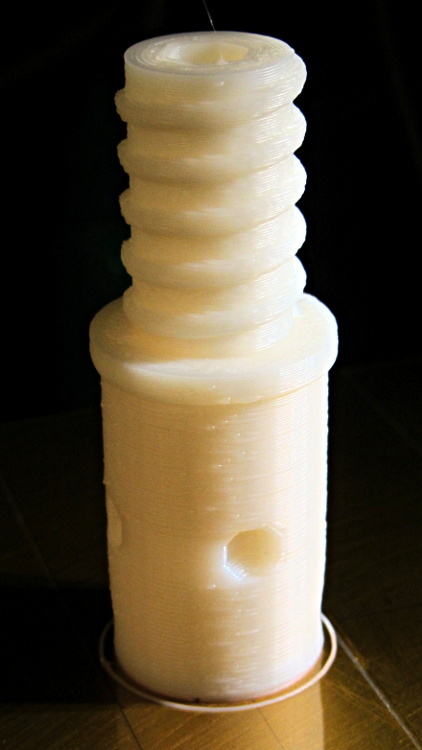 The OpenSCAD source code has a commented-out section that removes a similar shape from the shaft between the raised thread, but that brought the rendering to its knees. Fortunately, it turned out to be unnecessary, but it’s there if you want it. The skirt thread was 0.25 to 0.30 mm thick, so the first-layer height tweak and packing density adjustments worked fine and all the dimensions came out perfectly. 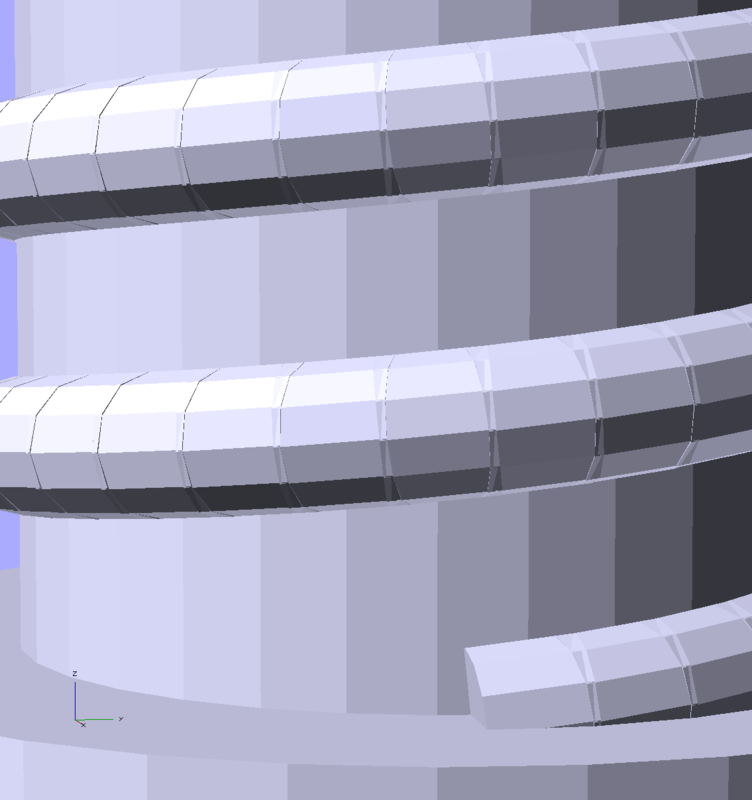 The cylindrical thread form doesn’t have much overhang and the threads came out fine; I think the correct straight-sided form would have more problems. The dimples on the side duplicate the method that secured the original plastic piece: four dents punched into the metal handle lock the plastic in place. It seems to work reasonably well, though, and is certainly less conspicuous than the screws I’d use. // Extrusion parameters must match reality! This entry was posted on 2013-04-01, 07:47 and is filed under Home Ec, Machine Shop, Software. You can follow any responses to this entry through RSS 2.0. Both comments and pings are currently closed. Good use of primitives and hierarchy! Actually plotting the 3D surface directly would be some truly annoying math. Which would produce lovely results far below the printer’s resolution! 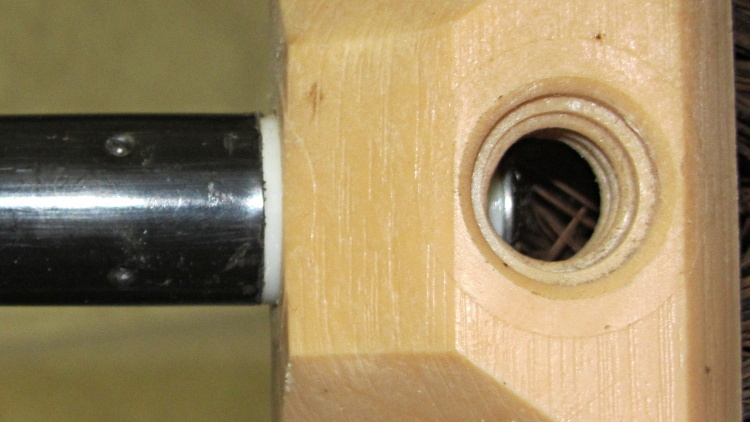 Is there a nut on the inside end of the bolt? 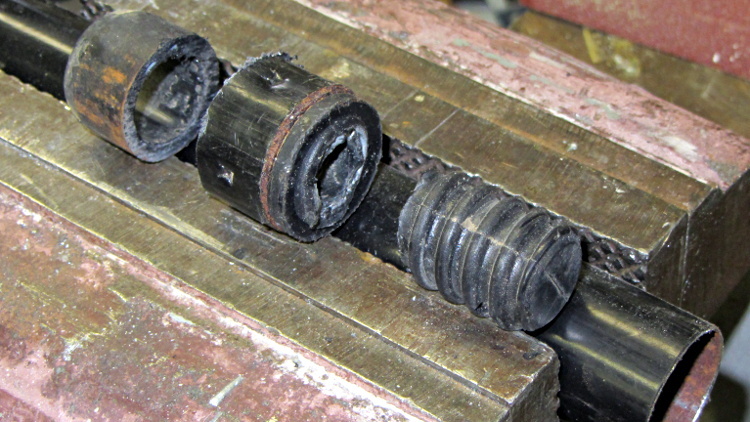 I perpetrated a similar repair a couple of years ago – the broken screw threads were epoxied to a foot-long chunk of 1/2-13 all-thread (it was a reasonably snug fit). 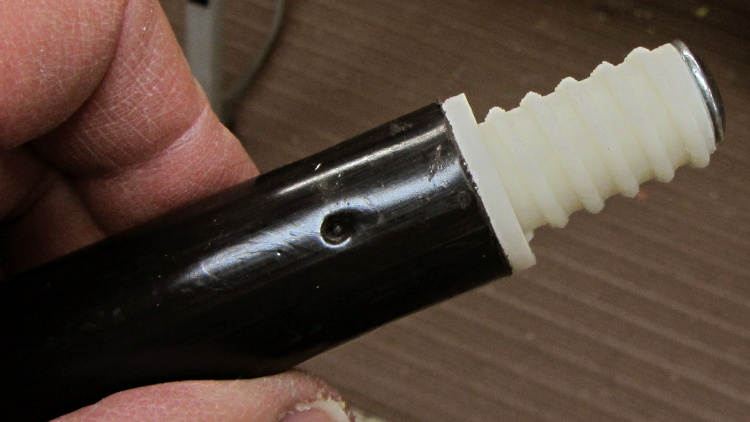 Once that cured, the end of the broom handle was filled with epoxy and the all-thread inserted into there. I used Methyl Acrylic epoxy so it would stick to the plastic. Fumes were horrible – this really needs to cure outside for a week before coming in. It held until the broomhead completely failed – it was one of those rubber “miracle pet hair brooms”, which actually worked really well for five cats. The perfect definition of a job well done! Speaking of toxic chemicals, it seems methylene chloride is the least awful solvent for the PLA filament used in the M2. I wonder if that’s still available as paint stripper? Talk about use-it-outdoors stuff: yuch! Yes, it’s still used as (a) paint stripper and (b) for disolving the caffeine out of the bean when making decaf coffee (though other solvents are used, perhaps more oten, today – liquid CO2 comes to mind). In fact, you can use it to measure the caffeine in your beans – dissolve the stuff, decant the solution, and dry it. You’ll want to use more than a normal amount of coffee. This gets complicated in the case of tea, because you’ll end up dissolving theobromide as well. Naming oddity – theobromide contains no bromine. Go figure. I’ll leave that to Raj, the man with the coffee plantation… he should know! There are some other plastics out there now, so a re-research should be done, but it’s still vile stuff. Still sold at Home Depot; just look for the can that’s not bulging and shows no rust spots. IIRC, Jasco sells it as a stripper. That’s what I found with all the affordable gloves for home use: methylene chloride just wiped ’em right out. It was easier to not use gloves and just try to get as little on my hands as possible, but I didn’t like it one little bit. I got three kilos of PLA for the M2, so it’ll be a while and, in any event, there’s not much else for filament-based 3D printers. I may eventually get some ABS just because it’s easily solvent-bondable with acetone (which looks downright tasty by comparison). Sorry, posting while tired. (More Linux installation stuff–I know all kinds of ways I can’t boot the P4 into Slack, but have one good way that does. FWIW, a Y2K Sony will not boot from a usb stick, but a RH7 distro on the same machine can write the CD-ROMs I need.) Whee. I meant “plastics” to be about glove materials. According to OSHA, there are a couple of inner glove materials (polyethylene and one other) which kind of work, if they’re protected by neoprene or nitrile. I think nitrile came out after my research. On filament plastic, I could like the ABS. Acetone is OK as a solvent, assuming you keep proper fire precautions. I keep mine on the far end of the barn from the heaters… I keep a small amount of carburator cleaner, but treat it with respect bordering on fear. I’ve destroyed some skin with that crud–takes about 6 months for the blister/dead skin cycle to end.